I’ve been dreaming about this for a year now. Ever since it became clear that China gets lots of YAHs, I knew that ornaments are coming sooner or later too. It has happened today, the first Chinese YAH ornament is out, Starbucks You Are Here Ornament Puer. Interesting enough, this is a completely new city. The bigger mug has been released too and I can’t see it in the pics from the Chinese mugs preview I did earlier. It means that the assumption about second wave was not accurate. 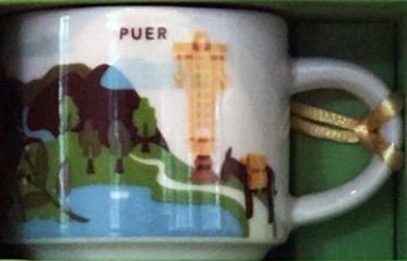 Apparently we should expect more than 18 mugs this summer!